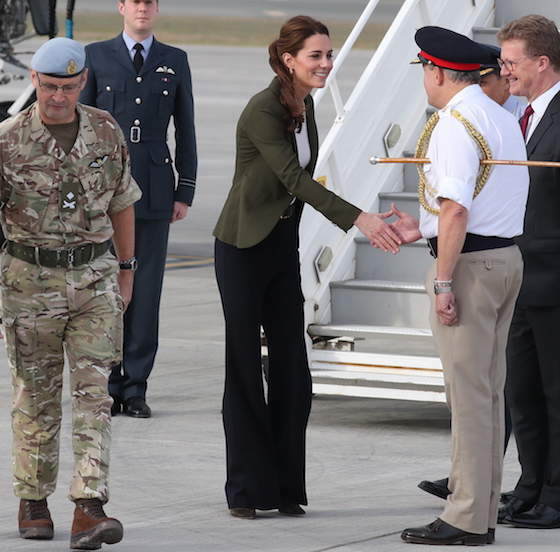 I was under the impression that Duchess Kate’s legs only existed in an on-duty Royal capacity if they were wrapped in pantyhose and covered from the knees-up by a skirt. But what is this? Duchess Kate wore pants today, and she’s still here! During the funeral for John McCain back in September, George W. Bush was seen pulling sweet Grandpa moves by sneaking a piece of candy to Michelle Obama, who was sitting beside him. Bush Jr. and Michelle recreated their funeral candy moment again today during the state funeral for Bush’s late father and former President, George H. W. Bush. It happened after Bush Jr. and Laura Bush walked in and greeted the line-up of ex-Presidents (and Donald Trump) in the front row. Bush shook Trump’s hand, then Melania Trump’s, then Barack Obama, and when he got to his girl Michelle, he took her hand and palmed her a candy. Brad Pitt and Angelina Jolie finally came to a peace agreement a couple of weeks ago regarding the custody of their children, and now The Blast is saying it’s officially filed with the court. Brad and Angelina were fighting tooth, nail, and sharp cheekbone over a custody arrangement for their six kids. The alleged gist of which was that Brad wanted a reasonable amount of custody and Angelina didn’t want to give it to him. Brad and Angelina came to a decision, but it’s only temporary, and it states that Brad will gain more visitation over time. Sources tell The Blast that as of right now, Brad gets less than 50% custody of the kids. Even though Brad is currently sitting on less than 50% custody, a source tells UsWeekly that Brad got exactly what he wanted. However, that increase in visitation is likely to happen after Brad and Angelina finalize all the financial parts of their divorce. There are hundreds of millions of dollars worth of property and money that need to be sorted out before everything is 100% wrapped up. Brad and Angelina seemed to really enjoy yanking each other’s chains during this whole custody process. So of course it feels a little strange that the custody part it would end (for now) on such a smooth note. The custody agreement was just…filed? Like, filed normally? Dropped off on someone’s desk, without any yelling or tearing of the folder it was filed in? If I were the person responsible for accepting those papers, I would have opened them with an old priest and a young priest standing close by. Because if it’s too good to be true, then it probably is, and those papers are cursed.